Orthodontic treatment can be done by many sorts of appliances, which most people call a ‘brace’. Often, teeth need to be guided more accurately than they can be using a removable brace. So a fixed brace is used. This has brackets and bands which are temporarily stuck to the teeth. A flexible wire joins all the brackets and allows the teeth to be moved. You can’t take the appliance out yourself, so it is called a fixed appliance. Your teeth can be damaged if you don’t look after them properly during treatment. The braces themselves will not cause damage, but poor cleaning and too many sugary foods and drinks can cause permanent damage to your teeth. Brackets, wires and braces can trap food and cause more plaque than usual to build up. So you need to clean your teeth and appliance very thoroughly. 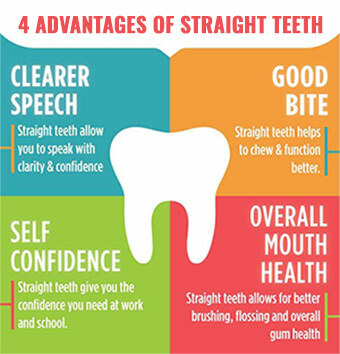 Your dental team or orthodontist will be able to give you advice about your brace and teeth. If you don’t do what they say, the brace can take longer to work and the treatment may be unsuccessful. If your brace is damaged or broken this can also delay the treatment. You will need to have your brace adjusted regularly to make sure it is working properly. Usually you will have an appointment roughly every six to eight weeks. It is very important that you go to these appointments, or the brace will take a lot longer to work. Sometimes when a brace is fitted, it may affect your speech and cause problems in pronouncing certain words. Lisping may also be a problem at first. But most people soon adapt and begin to speak clearly within a few days. If you have a removable brace it is best to take it out and put it in a brace case. You can buy these from your dentist, or from most large pharmacists. If you do remove your brace, it is important to use a mouthguard and then put your brace back in as soon as possible. It is also best to take your brace out if you are swimming. If you have a fixed brace you should wear a mouthguard designed for use during contact sports over the brace. Your dental team will be able to make you one. Whatever type of brace you have, you should avoid sticky, chewy and sugary foods. Chewing gum is not recommended as it can stick to your brace. Avoid hard foods such as whole apples, carrots, French bread and crusty rolls. These foods could break the wires and brackets that are part of your brace. Avoid fizzy drinks, sodas, pops, carbonated drinks and natural fruit juices, as these are often high in sugar and can be acidic. This can lead to tooth decay and erosion. Fizzy drinks can also stain the brackets of your brace. If you do drink these types of drinks, don’t sip the drink – use a straw instead. Water and plain milk are the safest drinks. It is very important that you take the time and effort needed to keep your teeth and braces clean. This will help you avoid problems such as tooth decay, inflamed gums, and ‘tooth decalcification’. Decalcification is when you lose the calcium from the surface of your teeth, and this may leave white spots on your teeth after the brace is removed. It is also important to keep having your usual dental check-ups with your regular dental team while you are having orthodontic treatment. This is to make sure that your teeth and mouth stay healthy. If you lose or damage your brace tell your dental team or orthodontist as soon as possible. Do not wait until your next appointment. 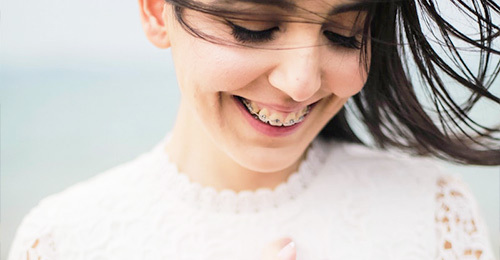 If you are not wearing your brace, or it is not in the correct position, this affects your treatment and makes it more likely that your teeth will go back to their old position. Dentists may charge for lost or broken braces before replacing them. Clean your teeth and the brace thoroughly after each meal. It is best not to brush your teeth until at least one hour after eating. Pay special attention to every tooth and the gum line around it. Total care toothpastes contain a number of active ingredients such as fluoride or tartar control agents to make them an effective multi-action toothpaste. They help control plaque, tooth decay and gum disease, while also freshening your breath. You can use an electric or ‘power’ toothbrush, although with care, as long as you can get to all your teeth. Ask your dental team or orthodontist about special small brushes which are suitable for cleaning your teeth when wearing a brace. ‘Interdental’ brushes can help you clean a fixed brace. They can get in between your teeth and are ideal for cleaning around the brackets of a fixed brace. Your dental team or pharmacist should stock these. You can use floss threaders to help you get dental floss under the orthodontic wires to remove trapped bits of food. Disclosing tablets contain a harmless dye which stains dental plaque. This makes it easier to see where the plaque is when you are brushing. It helps you to make sure that you are brushing your teeth properly. Your dentist, pharmacist or supermarket will stock these. Using fluoride mouthrinses regularly can help to prevent tooth decay and tooth decalcification. You should only use them if your dental team or orthodontist recommend them, and be sure to follow the instructions they give you. Your dental team or orthodontist will be able to show you special techniques for cleaning your brace. It is best to clean your brace over a sink full of water so that it isn’t damaged if you drop it. Keep a separate toothbrush just for cleaning your brace. Use toothpaste to clean it. Gently brush the brace and rinse it thoroughly with fresh water afterwards.